Montreal, Quebec, Canada, July 13, 2018 – Fednav Limited takes ownership of a 60th bulk carrier, an important milestone in Fednav’s history. This vessel, the MV Federal Dee, is the latest in a series of 22 box-hold handysize bulk carriers of 34,500 deadweight tons ordered from Oshima Shipyard of Japan since 2013. 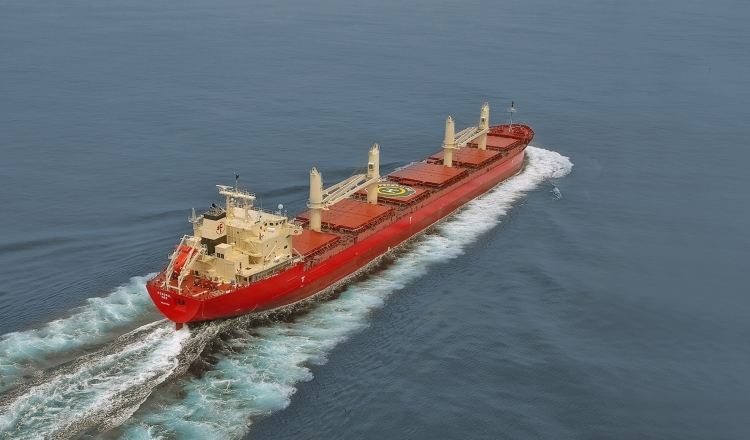 As the world’s largest operator of ice-class dry-bulk carriers and Canada’s leading ocean-going, dry-bulk shipowning and chartering group, Fednav operates a modern and high-performing bulker fleet of over 100 ships, the majority of which are owned. The company continues to invest extensively in its fleet rejuvenation and extension program to offer customers the highest quality ocean transportation solutions, while reducing the fleet’s environmental footprint. Earlier this year, Fednav also contracted for the replacement of its MV Arctic by ordering a new 30,000 DWT Polar Class 4 mine support vessel from JMU Shipyard of Japan. The ship will be flagged under Canadian registry and begin service as of 2020. Known for its expertise in navigating in ice, Fednav has for over 60 years played a leading role in promoting Arctic development and export. The company operates the three most powerful ice-breaking bulk carriers in the world offering year-round services transporting nickel and copper concentrates southbound and returning with all mine resupply material including Arctic diesel oil. Investing recently more than US $600 million into its newbuilding program, the company clearly demonstrates continued confidence in the shipping markets and its commitment to the Arctic, St. Lawrence, and Great Lakes trades. Fednav is a privately owned shipping company The company employs 260 office staff worldwide—160 in its Montreal headquarters—and maintains commercial offices overseas in Antwerp, Charlotte, Hamburg, Rio de Janeiro, Singapore, St. John’s, and Tokyo.